Y’all know by now that I deliver. If I say it’s the best whatevers, you know it’s gonna rock your world. 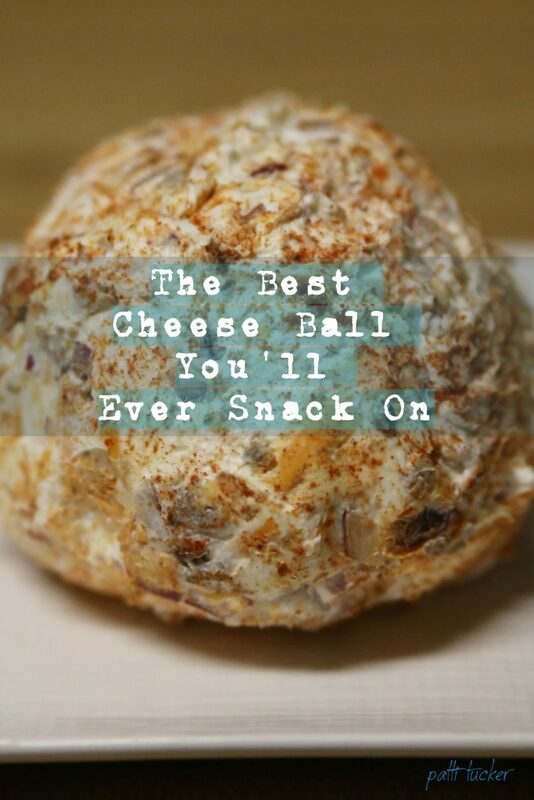 Get ready to lay yer eyeballz on the best cheese ball you’ll ever snack on. Oh, momma – me wanty NOW! Actually, there is still one of the cheese balls in my fridge as I write. The saddy sad/funny thing is this (there’s always a thing, right? ): as I was experimenting with a new flavor for a cheese ball, I came down with a raging cold. 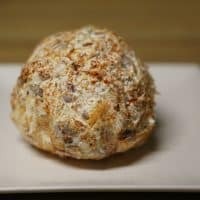 Typically, I have a list of folks that I share the deliciousness with once I’ve made a new recipe (this recipe makes two bigggg-ish cheese balls…I felt the need to share). I had told my SIL (pre-sickness) that I was making them and that she could come get hers the next day. Talk about a happy gal. Then – BAMMO! – the sickness hit and she thought better of entering the den of Cootieville, which of course left us with two cheese balls to devour. They are so addictive, we ate the first one licketty split and are now making our way through the second. It’s the Wild Wild West over here, baby! I know lots of folks only make cheese balls for the holidays or big parties/gatherings like the Super Bowl. I say that you’re gonna love this one so much, you’ll feel like it needs to be a new staple. Add my Spicy Pretzels to the mix and, man – that’s livin’! I started with my absolute new favorite sausage patties (NOT sponsored): Goolsby’s. Lawsy, people of the Internet, if you haven’t had a Goolsby’s sausage, I weep for you. 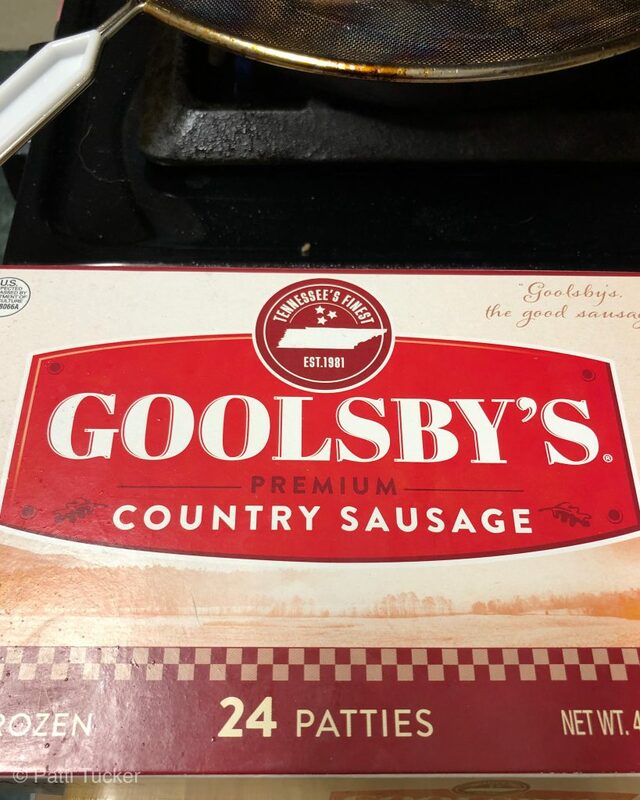 As a Southern gal, I know breakfast sausage – Goolsby’s is the realest deal. The thang I love best about Goolsby’s (you know – other than the amazing taste), is that the patties stay frozen until you’re ready to use them. Pull them out of the box (yep, frozen), place them in a hot cast iron pan (that’s how I roll) and cook those badboys till done. 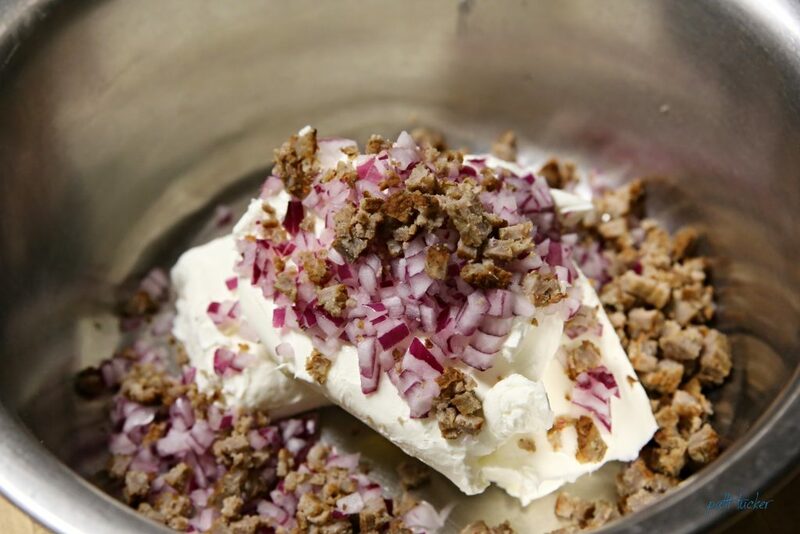 Here’s a shot of the purple onion, crumbled sausage and cream cheese, ready to be mixed (seasonings are in there too). 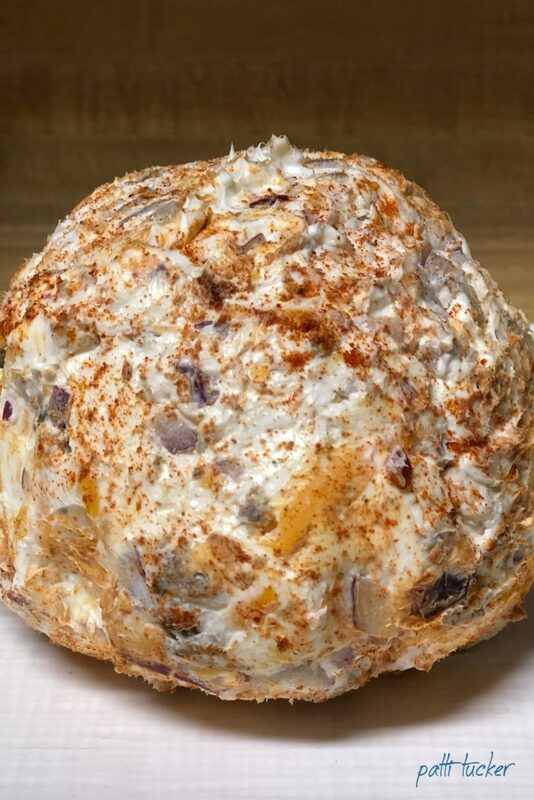 Add all the other ingredients, mix mix mix, then either roll the completed cheese ball in extra cheese, or smoked paprika, or both. NOTE: If you have never used smoked paprika, you’re in for a treat. The flavor it imparts to whatever you add it to is sublime. Once you start using it, you’ll find you’ll never buy the regular stuff again. I didn’t use a ton off smoke paprika on the outside (I used the cheese on the inside) – just a dusting. You’ll do whatever your taste buds demand! I have included a cup of Parmesan cheese in the recipe. It’s my personal favorite to use when making cheese balls. 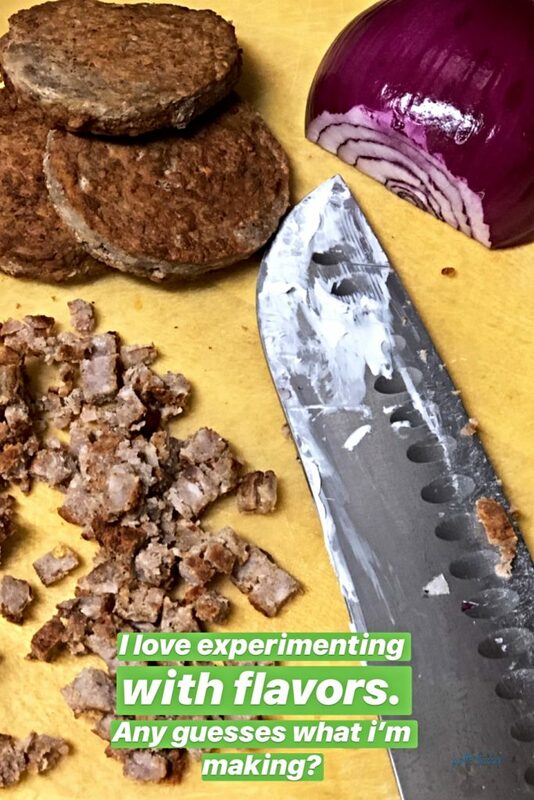 The flavor is delicate, yet melds with the power couple of sausage and purple onion like it’s on a mission of world peace. Hold hands, y’all. Let’s get this love thang right. As always, when making spectacular cheese balls, it’s best to let the flavors marry (♫ we’re going to chapel and we’re gonna get maaaaaarried ♫) overnite. Sure, you could eat it right after you make it. 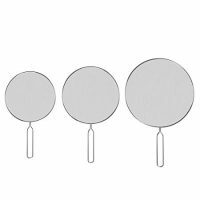 But – if you wait a bit (overnight), the flavors go beyond singular tastes and become one entity. Just like folks do when they marry. In a large bowl, thoroughly stir together cream cheese and spices. 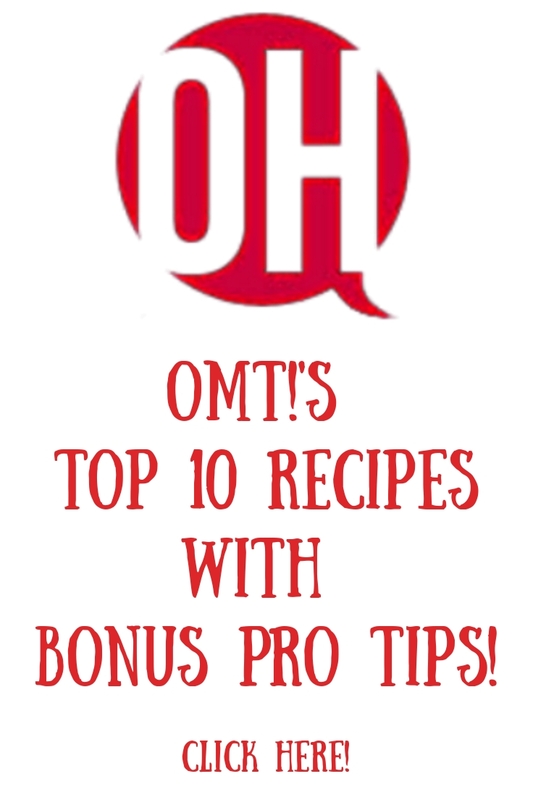 Mix in cooled crumbled sausage, diced onions, jalapenos and cheese. 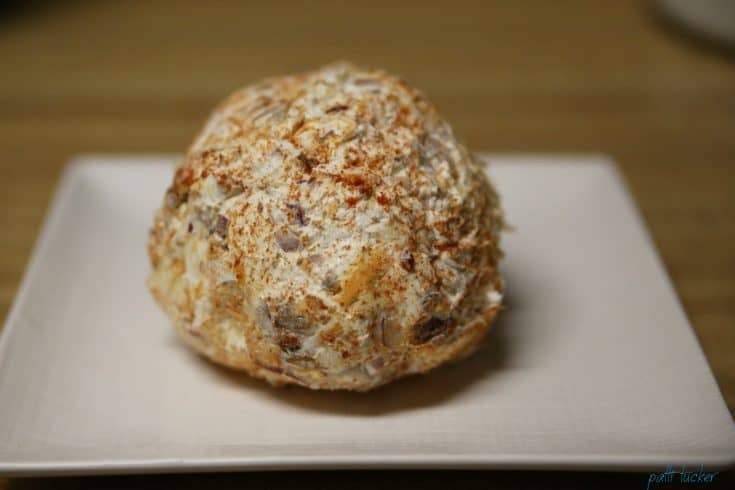 Cover in an airtight container and refrigerate overnight..
* Instead of adding the shredded cheese to the mixture, you can roll the ball in it to finish. 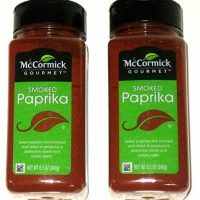 * Mix all ingredients (except paprika), then roll in smoked paprika. * To obtain the height of deliciousness, let the cheese balls sit overnight so the flavors can marry. * If making with kids, divide the cream cheese into four portions, each with different ingredients to their liking. * You can use more sausage, cause, you know, MORE SAUSAGE! I like the addition of sausage in this recipe. I haven’t made a cheese ball in ages! Honestly, it’s the best addition – EVAH! I love cheese balls–never had one with sausage before! Great idea! It was soooo good. Tell me if you try it. This looks amazing! I think can substitute the sausage for a vegetarian one, thank you for sharing! This cheese ball is sooo customizable! Oh I definitely need to make this soon! I’m thinking this will make a great Superbowl snack! Yaaaaas! Would make a great Super Bowl snack! Hi this is Kristina visiting from Pretty Pintastic. What a yummy idea! This looks incredible.